Australia, your 2013 birth year wine is ready (but can we make it Sunday every day)! What makes this duo so birth-year-wine-worthy is the structure. Wines explicitly built for ageing, with the eyes firmly fixed in a ‘next decade’ gaze, to the point where they’re not much fun now. That’s a bit dramatic as they’re not undrinkable. Just better later. 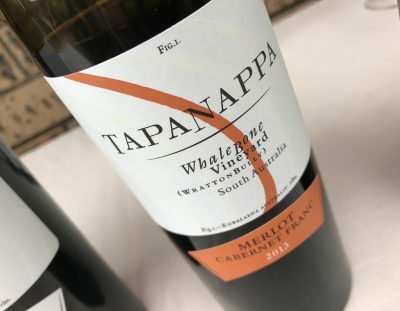 Compared to the fruit-forward, tannin-light style that typifies Australian wine, these wines may as well be from a different genre – a right bank Bordeaux genre perhaps. 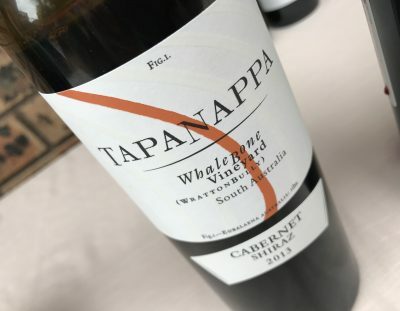 The Bordeaux lean is not surprising given that Tapanappa was originally setup by the Croser family, working with the Cazes family from Lynch Bages. Yet the Cazes are not involved in the project anymore, and these two wines from the Whalebone Vineyard have become more Bordeaux-esque (structure-wise at least) largely as a result of natural progression. All that is needed now is a few quiet years in the cellar. Spends 20 months in 90% new French oak. 56% Merlot, 44% Cabernet Franc. I almost wrote this off at first. Too much oak and extract. But the length and breadth is next level. Smoky vanilla oak dominates the nose, along with sprearmint, and the warm, polished, dark fruit a layer below. There’s actually lots of fruit here, even if it is walled up behind wood and tannins. Style-wise my first leaning was Saint Emilion, there’s a Napa-like frame to the ripeness here. Is there too much alcohol warmth? Gee it’s long and ‘winey’ rather than just fruit, and the palate itself has a lovely even flow to it. High-quality red that looked better and better each sip. Drink 2020-2035. 18.5/20, 94/100+. 14.8%, $79.95. Would I buy it? It’s a bit exxy for me, but would be good to have this in the cellar. While the winemaking is similar to the Merlot Cab, this is a very different wine. More dark berry fruit and it feels more ‘conventional’ compared to the evocative and sexier Merlot Cab. Lots of grainy tannins here, and the Cabernet gives grunt and punch. Excellent flavour intensity and the detail here is first rate, a big bundle of firm, oak-framed, deep Cabernet in a bold ripe, yet not OTT form. Interestingly this feels lighter than the Merlot Cab, which you wouldn’t expect, though the alcohol is an indicator. Classy wine. Mammoth tannins! Best drinking: 2020-2035. 18/20, 93/100. 14%, $55. Would I buy it? Would be worth sharing a bottle in a few years time.